Today, we take a look at an awesome user-submitted DIY project. 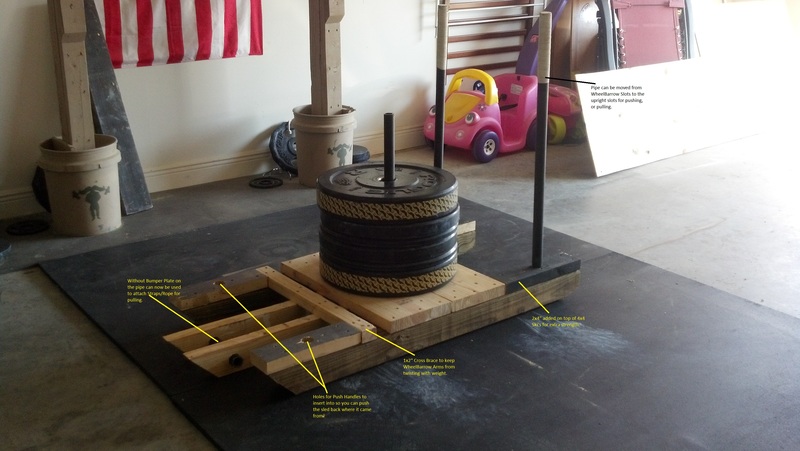 I want to post a DIY project today, because my recent guest post at the Art of Manliness, “How to Turn Your Garage Into a Home Gym”, got quite a bit of traffic and I think it is only fitting to have a garage gym related post for all the new e-mail subscribers who may have gotten here from the Art of Manliness. To all the new readers, welcome! If you want to know why End of Three Fitness is different than most other fitness websites out there, check this out, “The End of Three Fitness Difference”. Enough chit-chat, let’s build something! Today, we make a DIY Wheelbarrow and Sled. An innovative 2-in-1 DIY project cooked up by DakotaHealey21, which is his username in ‘The Rally Point’, our End of Three Fitness community. 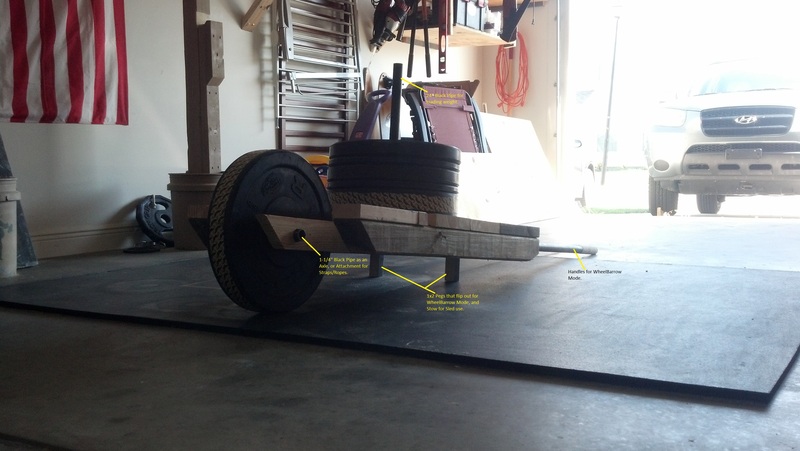 This is the second user-submitted DIY project here at End of Three Fitness (the first being Plyo box #2), and I love it when others can contribute. So, if you take good pictures and can do a good write-up, feel free to submit here. You may also need to know exactly what we are building…If you have any questions watch this video, it will clear things up. We do not have any pictures of the steps, so refer to the written instructions and view all pics to understand how it is constructed. Ask questions if you’ve got them! Take the 8′ section of 4×4 and cut it directly in half. These will be the 2 main Ski’s that drive your sled, and where you will plug your pipes into for handles. Cut that 2×10 into two 24″ lengths, and place them centered across your 4×4 Ski’s. Screw them in very well with the Deck Screws (I used about 5 screws per side of each board, in a “zig-zag” pattern), I also used a bit of Gorilla Glue to ensure a good, solid fit. *Note: When fitting your 2x10s onto the Ski’s ensure everything is square before screwing in everything and moving on, not only will this save you from measuring every cut, but one Ski will not be pointed out, or in. Now you want to take your 1×2 and cut a 24″ length to go across the Ski’s on the front side of the sled, about and 1-1/2″ off the 2×10, secure this with some glue and screws. This will be the Cross Brace for the WheelBarrow Skis later. 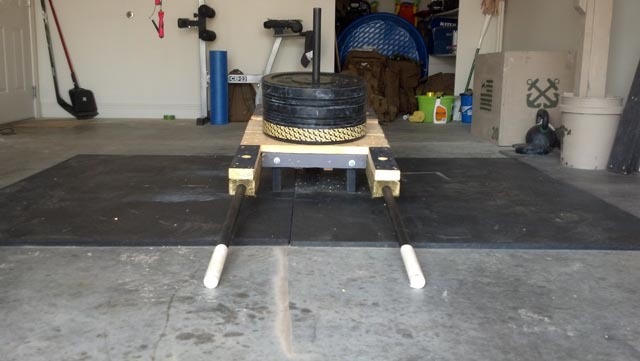 Now that your sled has its basic frame, measure and cut your 2x4s to fit on top of the 4×4 on either side of the 2×10’s. Secure them with some glue and Screws. Now is the time to cut two 2x4s at about 36″ each, with a 45* angle on the ends. Put both of them together flush and secure them together with a couple screws (you are getting ready to drill your holes for the pipe to go through). You want to set the center of the holes about one inch back from the bottom of the 45* angle, and, of course, in the center of the board. Drill your hole, and take the screws out securing the two boards together, now you have two holes that will match up perfectly, no “fiddling” with your pipe to get it in and out. To attach the Skis to the Sled just slide them under the sled around 3-1/2″ inches apart and get your bumper plate (or SOLID RUBBER wheel if you prefer) and roll it in between the two Ski’s. All you have to do now is adjust the boards until the gap between them are about a 1/4″ outside the bumper plate, make sure everything is square and secure the skis to the Sled with screws, and some glue. *Note: Making visible marks of where the Ski’s line up will make putting glue on and getting them centered back up much less of a hassle. Now is the time to get your 1-3/8″ Bore Bit ready to drill the holes for the handles to go into. Mark the center of the holes for the top of the sled (4) about 5-6″ in from each end of the Ski’s. These holes need to be drilled about 1″ from the bottom of the Ski (approximately 4-1/4″). 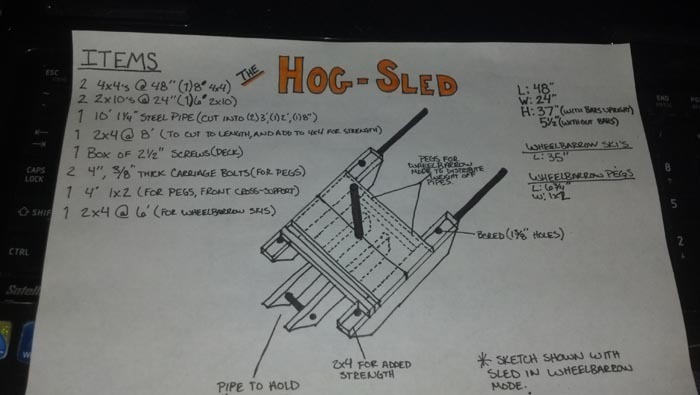 For the Hold on the center of the sled to hold the pipe for loading weight, you need to flip the Sled over and attach 2 pieces of 2×4 about 3″ in length in between your already attached WheelBarrow Ski’s, this is to give the pipe somewhere to rest when inserted into the sled. Now get to Drilling! *Note: It is helpful to use a piece of tape on the drill bit to mark how deep to go. Make sure you are drilling as straight up and down as you can! Now it is time to attach a piece of 1×2 to the back side of the sled under the 2×10 (pictured) so you can attach the Hide-Away pegs for the WheelBarrow Mode, also needed are the pegs, which will be 6-1/2″ long, and have a 45* angle cut off the top inside corner (to allow them to spin one way). Once you have measured and cut the piece’s to length, secure the 1×2 to go under the 2×10 in between the Ski’s with, yet again some screws and glue. Now drill the holes for the Carriage Bolts about 2-1/2″ from the inside of the Ski’s. 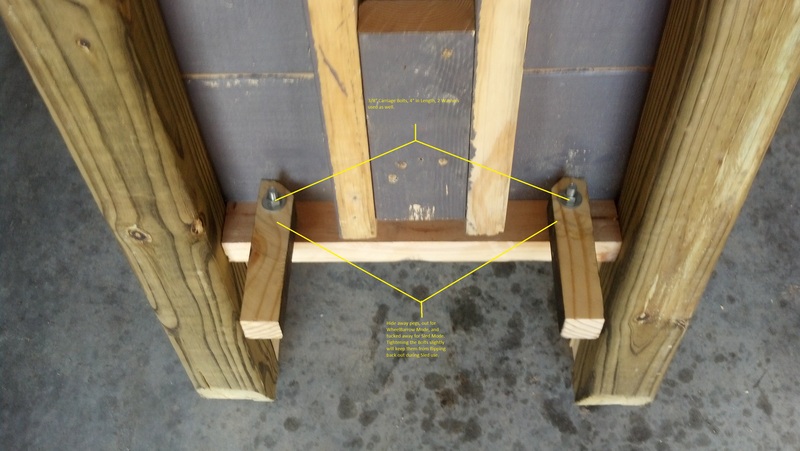 You will need to measure where to drill the holes in each peg to ensure the pegs will both sit at the same length when attached to the sled with the bolts. Now you have an awesome 2-in1 DIY project that is sure to blast you into shape! Check out all the other DIY projects in the DIY Corner.